Season the flour with salt and pepper and in a bowl or plastic bag, mix well then use to coat the chicken pieces well, shaking the excess flour off. 2. Heat the butter and oil in a flameproof casserole until hot then add the chicken and brown on both sides. 3. 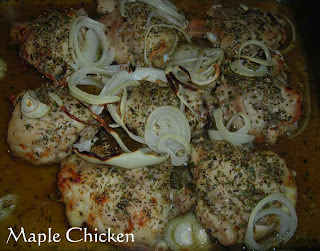 Remove the chicken from the heat then pour the maple syrup over the top and sprinkle with the dried herbs. 4. Arrange the onion slices over the chicken then pour the chicken stock over the top. Bake for 40 minutes, basting two or three times during the cooking. Serve hot.